Turkey: Supporters win against Passolig! 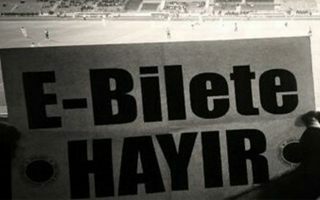 The e-ticket system was expected to by a milestone change in safety and comfort for Turkish football, or so it was advocated. And indeed it proved a revolutionary idea, but not in the way it was intended. It literally caused a revolution by supporters from across the country, who have been fighting for two years to abolish the system. In principle the fan ID regulations introduced mandatorily from 2014/15 onwards (voluntarily before that date) were similar to Italian ‘tessera del tifoso’ or Polish ‘karta kibica’. It means every fan should have a number assigned and embedded in an ID card. However in practice the system went far beyond written law and forced supporters to use cards issued by Aktifbank, who operates the system. The lower slogan means roughly "gone with e-tickets! ", while the upper... isn't appropriate to translate. But what doesn't require any translation is the sight of empty stands, something all too common over the last two seasons. Instead of a controversial safety measure, the cards became an even more criticized commercial tool and caused an unprecedented wave of protests. Fans successfully boycotted games, organized demonstrations and brought their case to courts. Both the Consumer Court and Constitutional Court in Ankara eventually agreed with their stance, though the first one is still to give its final ruling. The latter court ruled on Wednesday that clubs and the Turkish Football Federation cannot share data about supporters with any commercial third party, thus challenging the legality of Passolig in its entirety. Now it’s up for the Consumer Court to give their final judgement on March 2, 2016. The fan rights association Taraftar Hakları Derneği celebrates success, but at the same time cautions everyone to remember that the legislation causing all the havoc is still in place and the fight is not over.